Vintage Cathedral Engagement Ring with Pave-Set Diamonds | Shane Co.
Admire this 14k white gold ring from any angle and you will see rows of shimmering diamonds. As part of our exclusive Couture by Shane Co. collection, this ring displays 12 channel-set princess cut diamonds, at approximately .52 carat TW, that are flanked by rows of 72 round pave set diamonds, at approximately .63 carat TW. The total carat weight of this stunner is approximately 1.15 carats. 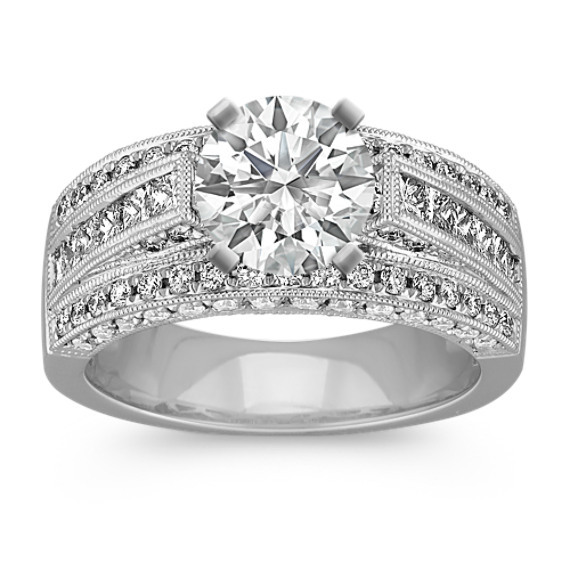 Add the center stone of your choice for a dazzling look she will love. Gemstone Carat Weight :1 1/6 ct. t.w.